One year ago, more or less, I discovered fontello, and I have used this tool in my past projects and is becoming indispensable. For example, I usually use the fontAwesome. In version 4.2.0 are 479 icons. If a project you use 10 of these icons, why would you upload the others 469 for nothing? The benefits to icon fonts extend far beyond this link post, but the time they save in having to produce, extract, save, implement, customize, rinse, and repeat icons in a project is priceless. 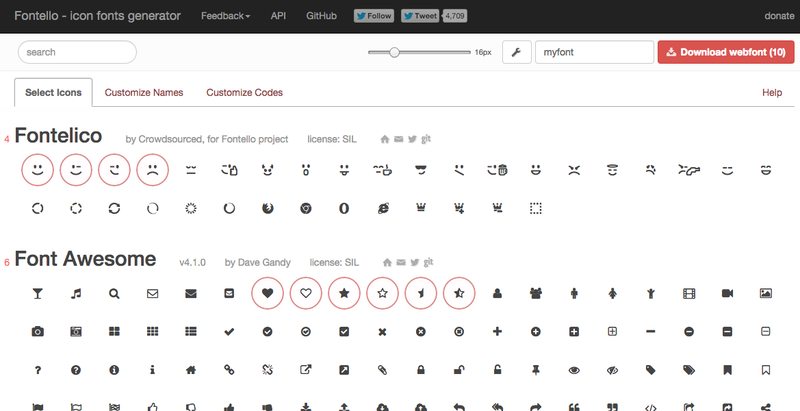 Scalable, CSS-able icons are a huge time saver, but with so many awesome icon sets out there we don’t want to find ourselves embedding multiple @font-face fonts to get the full set we want to use on a project. Fontello helps with that by letting you build your own, on a single font file comprised of pretty much anything you want. The icons will be single-color. There are some fancy (hacky) techniques for multi-color however, and modern trends and HIGs (human interface guidelines) suggest single colors anyway.